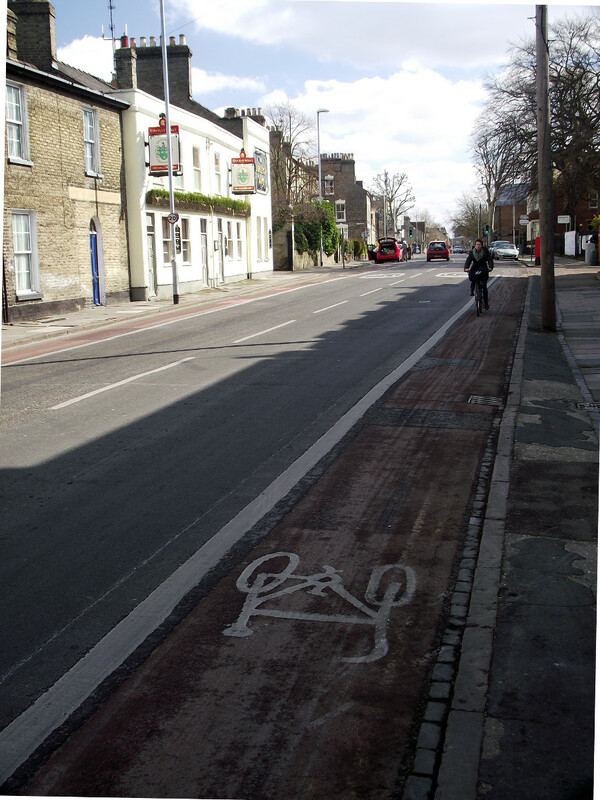 Is cycle parking a ‘problem’ in the Kite area of Cambridge and should car parking spaces be replaced by cycle parking? This is what Cambridge Cycling Campaign asked the County Council election candidates and from their responses there is limited support for this. 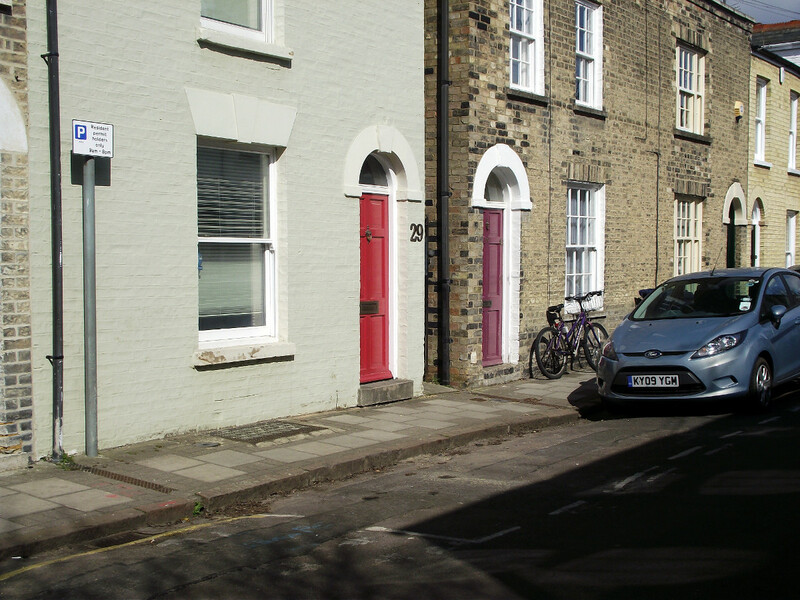 Ed Cearns, the Liberal Democrat candidate, thinks there is not a problem with cycle parking because “a number of properties have railings and many other residents have secured loops on the front wall of their property” (he also supports more cycle parking across the city). Simon Sedgwick-Jell, the Green Party candidate, points out that the “parking of bikes in [the] street [is] a crime problem”. Informally parked cycles on Victoria Street. 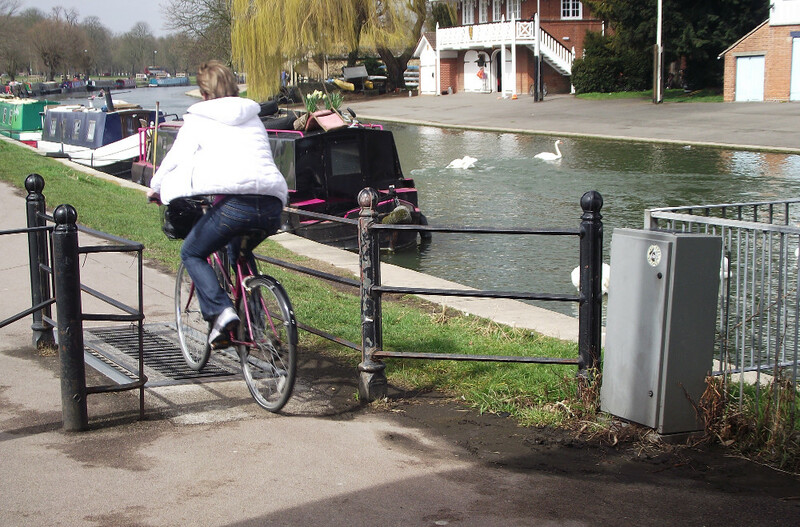 Cycles can obstruct the pavement. 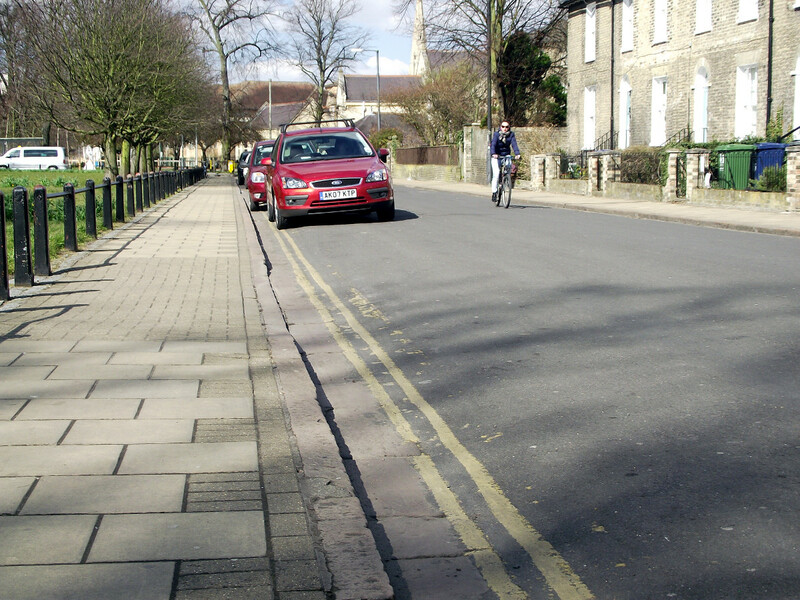 On this wide pavement on Parkside cycles are out of the way. There are some 200 cycles parked on the pavement in Kite, I wonder how many of these Mr Cearns tripped over while canvassing the area? 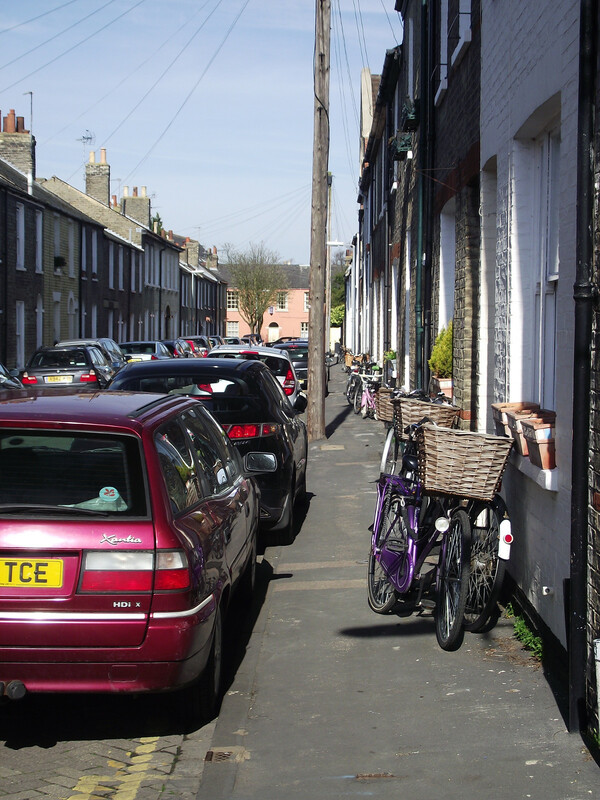 For able-bodied people with normal eyesight a little more care is needed but unfortunately cycles parked against railings and walls in terraced streets are a hazard to those with impaired eyesight (amongst others) in the same way that wheelie bins and cars on the pavement are. 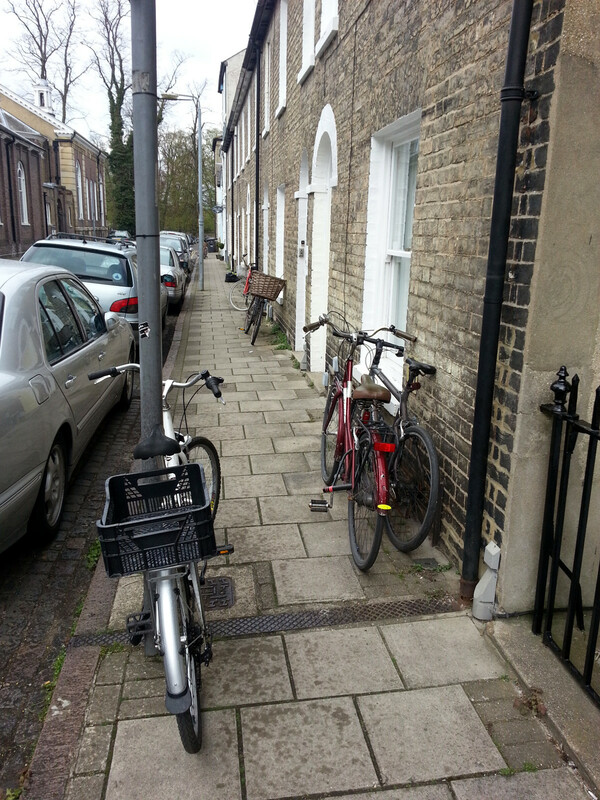 Obstructions and trip hazards caused by cycles are a problem for anyone trying to walk in the streets of Kite. While many of the cycles are secured to special hooks and railings as Mr Cearns points out, not all are. Those not secured are at risk of theft with some 163 cycles reported stolen in Market ward in the three months to March 2013. [source] Due to a concerted effort by Cambridgeshire Police neighbourhood teams cycle theft is falling. Obviously with many thousands of cycles parked in the city centre theft is not only from residents in Kite. There are also probably more thefts that have not been reported. 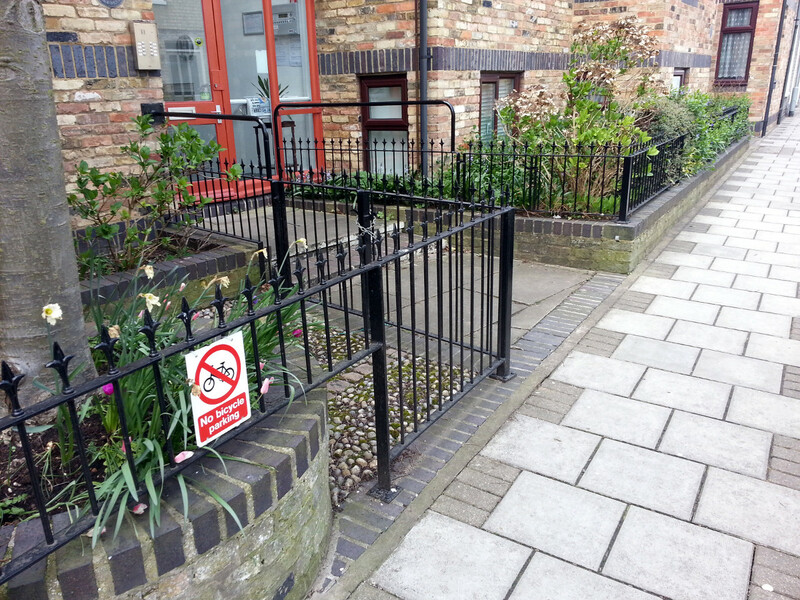 Cycles are not welcome on these railings on John Street. The City Council has approved a project to create up to 710 additional on-street cycle parking spaces, in addition to continuing to look for a location for a third cycle park. However none of these on-street spaces are in Kite. 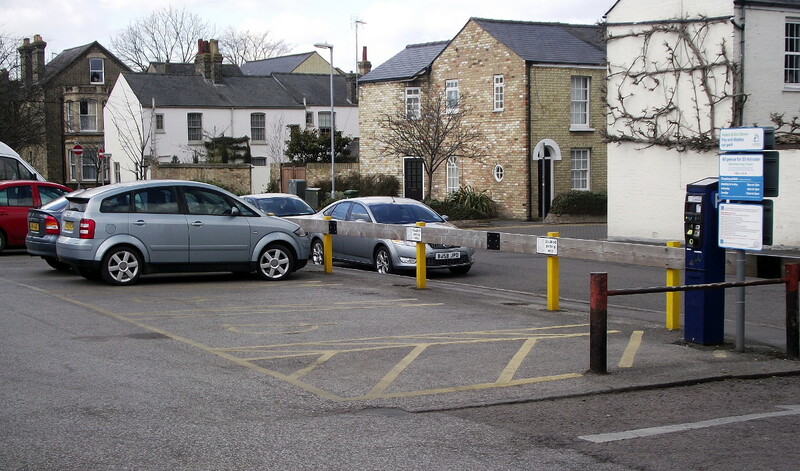 Market LibDems’ residents’ parking update newsletter says that some new residents’ car parking bays will be added, but there is no mention of cycle parking. I believe we need some cycle parking for residents in Kite (and other areas of the city). This parking needs to be convenient and secure. 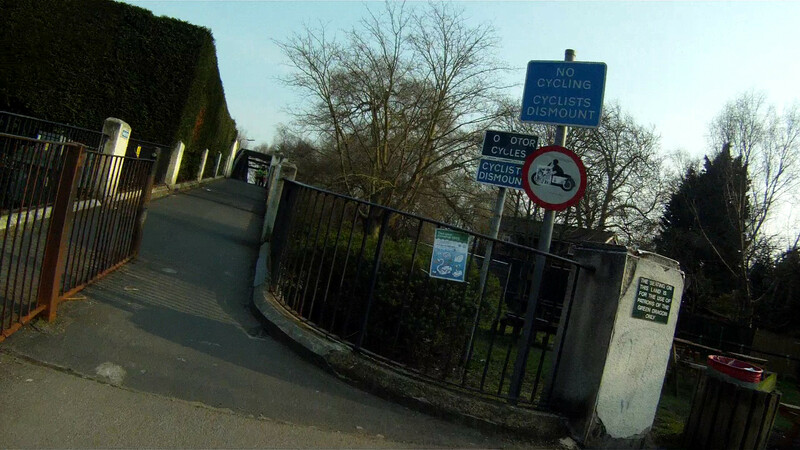 By providing cycle parking we remove obstructions from the pavement, help reduce the opportunity for crime and make it easier for those who choose to travel by bike. 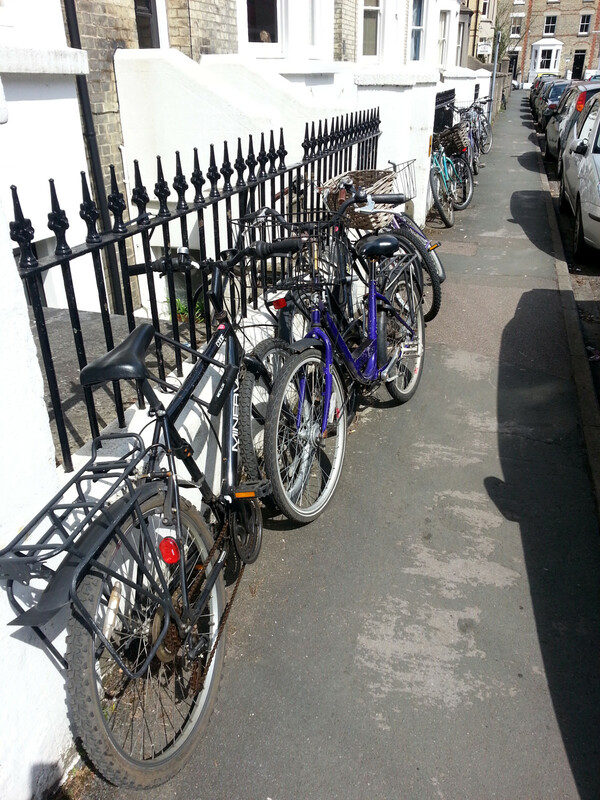 Just a few of the 36 cycles parked in Warkworth Street. I did not count on East Road, Burleigh Street, Fitzroy Street or the Parker’s Piece side of Parkside because these are more likely to be cycles visiting the area. 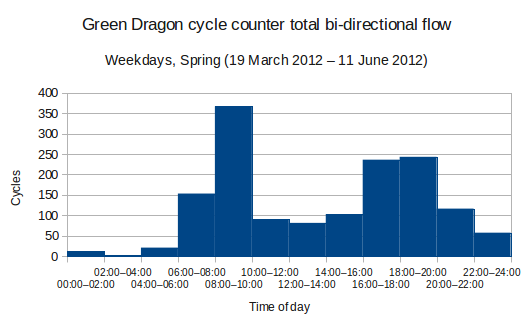 The count includes cycles in front gardens as well as actually on the street because I want to estimate the demand. 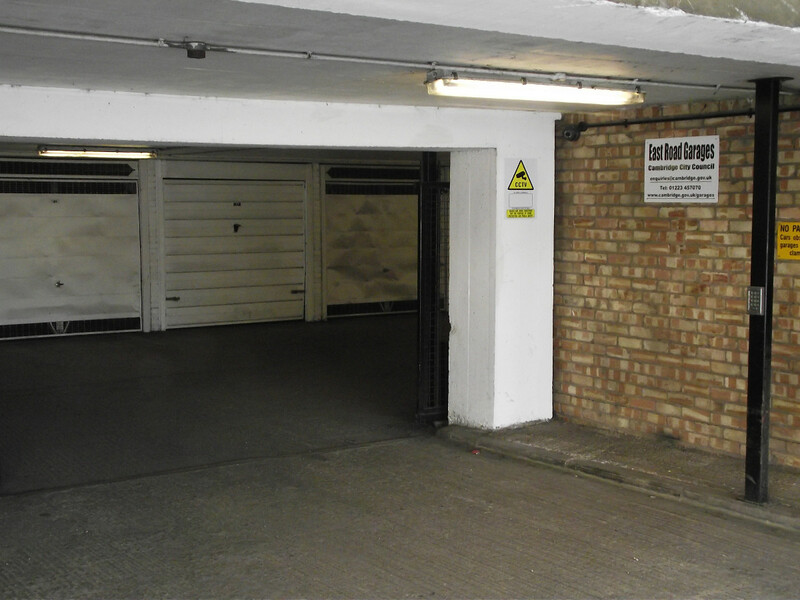 Note that some properties in the area have internal cycle parking and some have garages that may have cycles in them. 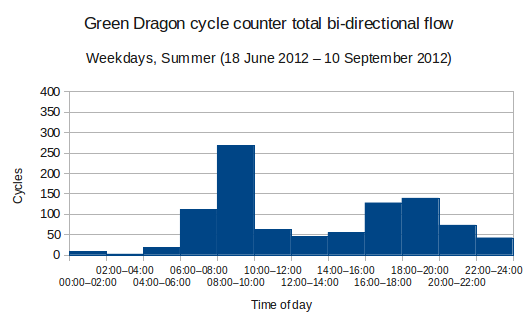 So the total number of cycles parked in the area is unknown but is at least 219. 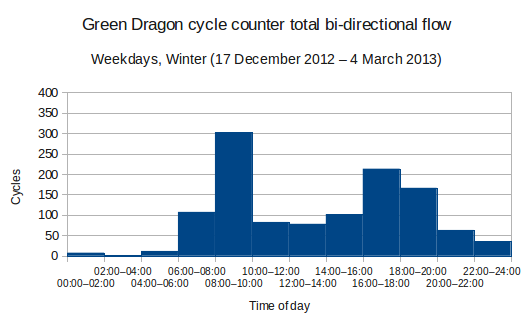 The vast majority of the cycles counted will be those of immediate residents however we cannot be sure of this. Update: I did not count formal cycle parking (hooped stands) or car parking. There is some cycle parking in the area, particularly at the edges, and yet hundreds of cycles are parked on the street. It has also been pointed out that some bikes may have been abandoned. Candidate’s leaflets, nothing from the Green Party yet. 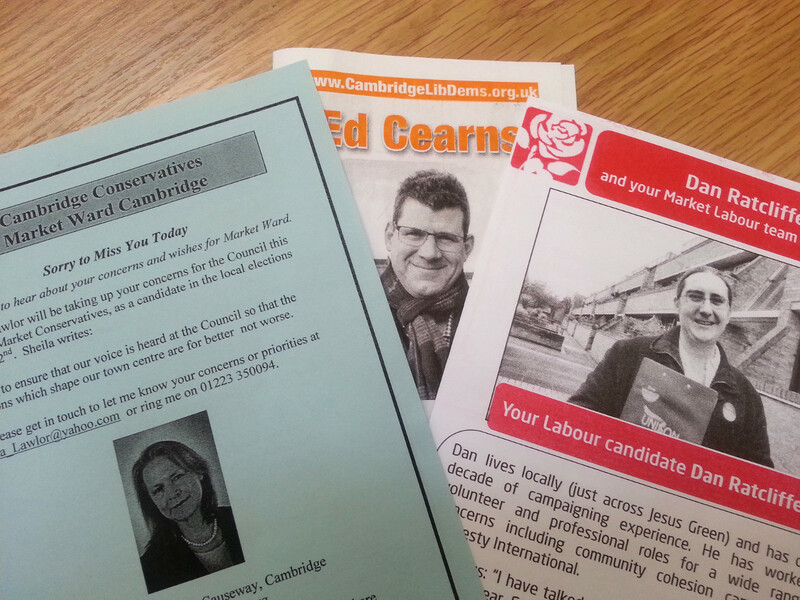 What is the most important issue in the forthcoming Cambridgeshire County Council elections? The £2,000,000 per year interest charge for the Misguided Bus that may never be recovered? No. The £1,000 per pupil funding shortfall for secondary schools? No. How Cambridge will expand over the next decade? No, it’s residents’ parking. 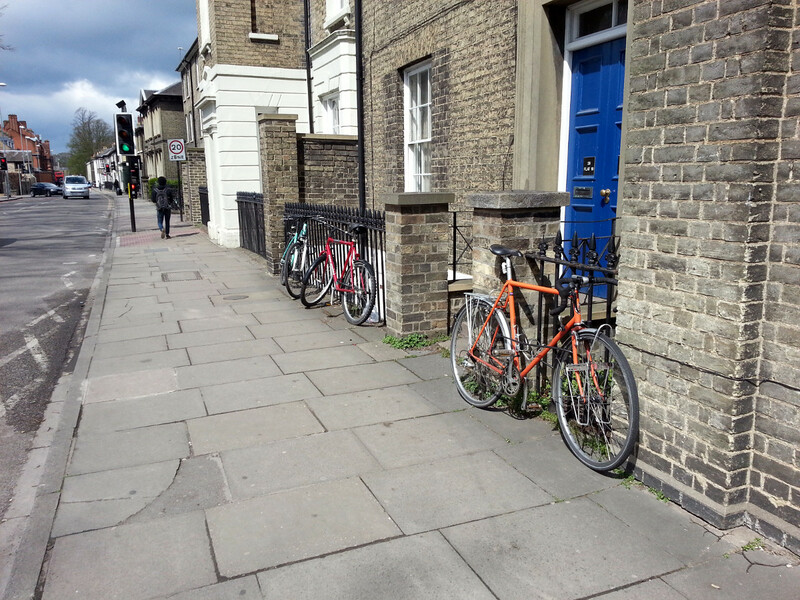 There’s a demand for residents’ cycle parking in Kite, and other areas. Sheila Lawlor, the Conservative candidate in Market Ward, makes the astonishing statement that she will ‘Take whatever action is needed so residents can park.’ I would imagine she is talking about car parking, which is a shame as there is considerable demand for cycle parking too. Labour’s Dan Ratcliffe supports the upgrading of the A14, which is likely to ‘set back a long way‘ public transport, cycling and walking in the city centre according to Tim Bick (leader of the City Council). This motorism, addiction to motoring, is odd since the lack of cars and traffic is part of what gives the city centre its character. It’s also odd as we may have reached Peak Car so this expansion of parking is beginning to look like a policy from the last century and not one for the future. The candidates also seem to be re-enforcing the idea that residents own the piece of tarmac outside their house. It’s not the County Council’s responsibility to find you a place to park your car any more than it is their responsibility to find space for your 42″ TV. It is also surprising as the March 2011 Census tells us that 40% of households in the Market area do not have a car or van. So who’s going to represent those against the privatisation of the public highway? A young man in an inexpensive suit knocks on a door in John Street. The householder answers. Man in suit: Good morning. Are you concerned about the cost of your monthly bills? Would you like to save £132 a month? Householder: Ah, yes. Are you from the electricity company? Man: I’m from the City Council. If you give me your residents’ parking permit then we will pay your Council Tax, that’s a saving of £1593 a year! Sign here and save money right away. Householder: But where will I put my car? Man: We have a special offer on, if you sign up now I can give you free membership of the car club and two thousand driving miles. After listening to the Freakonomics podcast Parking is Hell I began to wonder about the price of car parking in Cambridge city centre. The podcast describes that in some cities a significant proportion of cars are cruising for parking and not actually going anywhere. Economists and academics have suggested that the price for parking can be adjusted to ensure there is always one or two empty spaces so there is no wasteful cruising for parking and drivers find parking more easily. A project called SF park is trying this out in San Francisco. If you ask people what they want in a suitcase they say ‘lighter’ but even a light suitcase filled with 15kg of clothes is still hard to move. The solution was adding wheels to make the suitcase easy to move. The moral is listen to people’s problems and think laterally about solutions. Perhaps the price for this value resource isn’t right? Perhaps some people would respond to a financial incentive to give up their permission to park so there is room for others? But what is the value of this (notional) parking space? What is the value of this parking space? 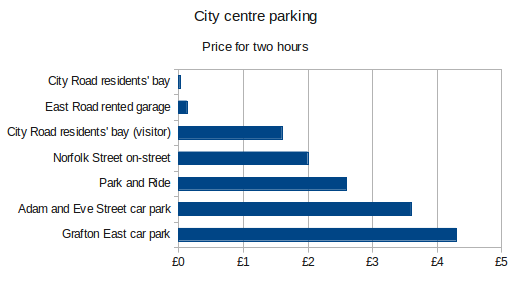 In my post on city centre parking prices we saw that residents are charged £0.11 for all day parking whereas parking in the Grafton East car park would cost £24 for the same period – quite a difference! 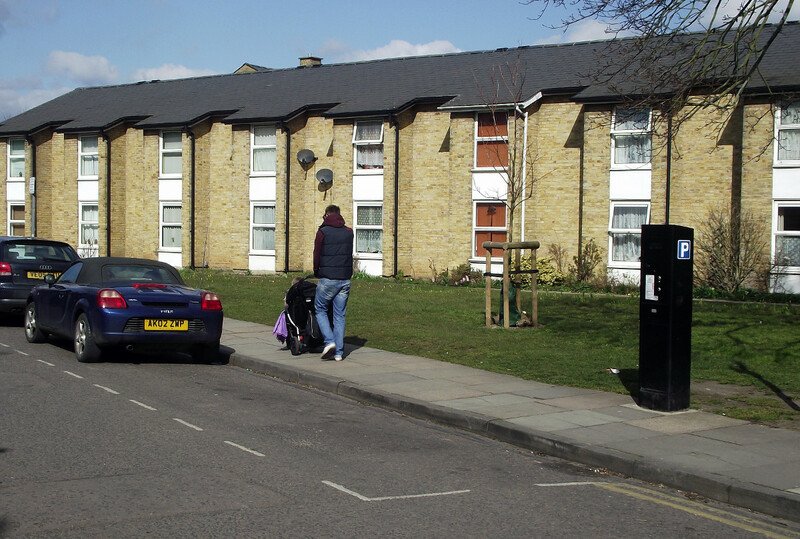 At £24 per day a residents’ parking permit would cost over £8,000 per annum, wow! But that comparison is too simple because the car parks do not have a utilization of 100% and you might expect a discount for bulk buying a year’s parking, etc. 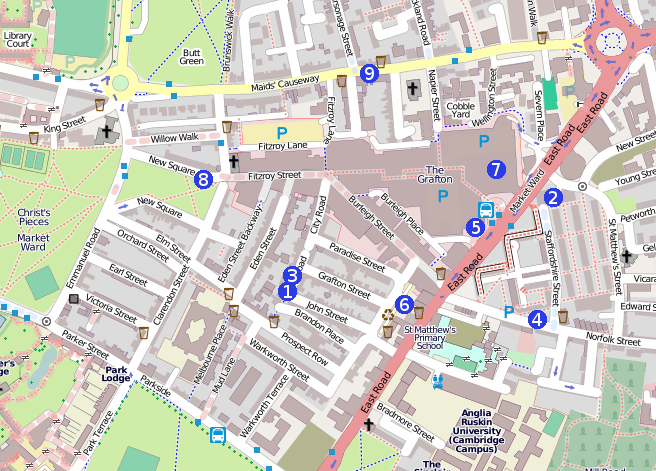 Cambridge City Council got a revenue of £1,574 per annum per space in the Grafton East car park and more than £2,000 per space in the Adam and Eve Street car park in 2011/12 [Source: Cambridge City Council, response to Freedom of Information request 2142]. So theoretically the City Council could change residents’ parking spaces in to on-street pay and display spaces and receive an additional income of £1,500 per annum. The Band D Council Tax for 2012/13 is £1,512. Hmm. Would you give up your residents’ parking permit in return for paying no Council Tax? Yes it’s true you can park for two hours for just 2p and all day for 11p right next to the Grafton Centre in Cambridge. Did you think parking was expensive? Perhaps you are looking in the wrong place. In my next post I will look at what this could mean for city centre residents. 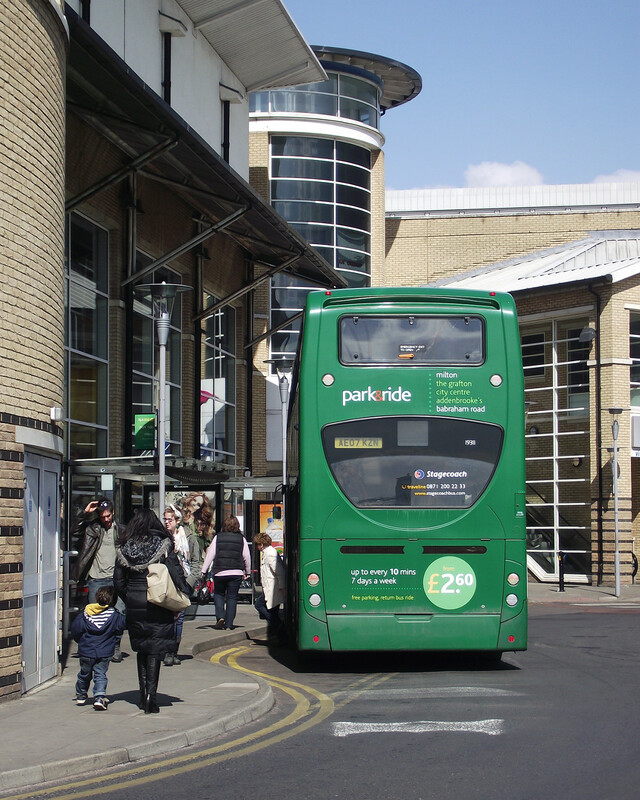 If you are eligible for a residents’ parking permit the cost is £81 per year and the bays operate 9am–8pm seven days a week. Residents can also get an indefinite number of visitors’ permits for £8 for five allowing parking in residents’ bays for one day for one vehicle. Neither a residents’ or visitors’ permit guarantees a space however. If you are prepared to plan ahead and pay for four weeks the City Council will rent you a garage from £8.91 per week plus VAT, assuming there is a space available. I haven’t been able to find any information on current occupancy. Parking at the sites on the edges of the city is free and the bus fare is £2.60 for the cheapest return fair for one adult (who can take children with them). This is a short stay car park so you cannot park here all day. This is the most expensive of the legal options but there is no shortage of demand with queues outside and one-out-one-in operating at some times of the day. Unless you have a Blue Badge parking here is illegal. Civil enforcement officers regularly check this area and you will get a ticket that costs £25 if paid quickly, or the same as all day parking at Grafton East car park! Please do not park when and where parking restrictions are in force, it is illegal, inconsiderate and can block access for emergency vehicles. Parking here is illegal and the police could issue you with a Fixed Penalty Notice that costs £35 if paid quickly. However it’s also likely that the police would not see the illegally parked vehicle or take any action if they did, so the cost could also be £0. Please do not park in cycle lanes, it is illegal, inconsiderate and can cause danger for cyclists, pedestrians and motor vehicles. 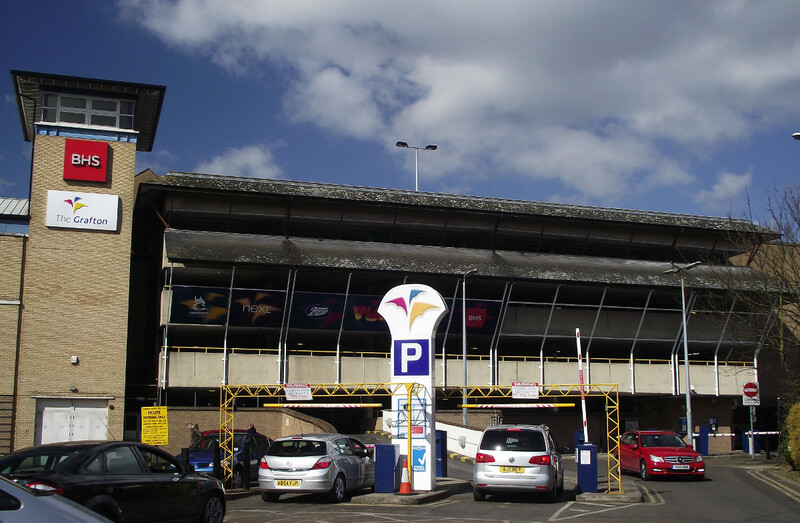 There are a few pay and display parking bays at 50p for 30 minutes, maximum stay of two hours.